Virginia was made for me, you need to understand. Other ’90s weird kids might feel that too, but it’s for me. 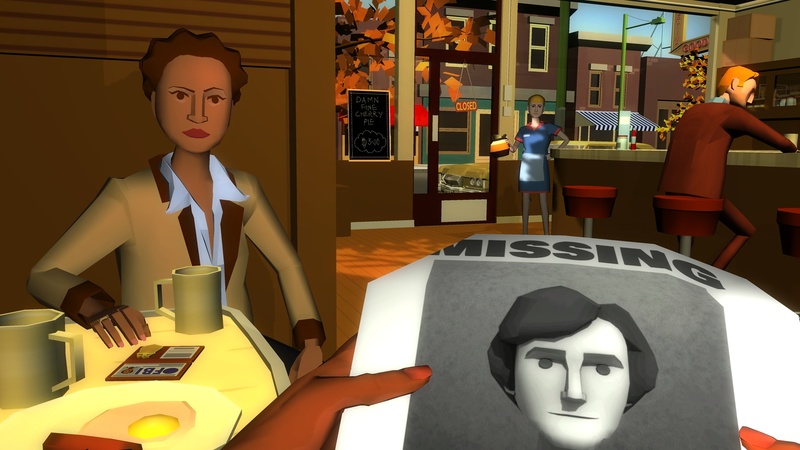 A weird first-person “interactive drama” with low-fi untextured polygons and a period story inspired by Twin Peaks and The X-Files? It couldn’t be for anyone else. Two FBI agents (two non-white ladies, unless I’m mistaken) investigating a missing child in a small town where the locals are weird and the cherry pie’s “damn fine” is an idea I adore so much I threatened Alec (me! me who rejects absolutely revenge, aggression, and retaliation) when he considered writing about the game’s announcement himself. It’ll be important for Virginia to establish its own identity, of course, to be more than a collection of references. Deadly Premonition only came alive when it stepped out of Twin Peaks’ shadow. Mentioning that stuff at the start is the best way to get coverage of your announcement from suckers like me, though. Variable State is Jonathan Burroughs and Terry Kenny, who met through AI company DeepMind–one of the many AI/robotics companies Google has eerily acquired. Before then and before going indie, they worked on games including B movie pastiche The House of the Dead: Overkill, which Burroughs wrote and was a designer on. Music’s coming from Lyndon Holland, whose portfolio seems to go heavy on the weird and melancholy.